Years ago, I was inspired by a recipe in Cooking Light magazine that offered a basic marinara sauce and suggestions on how to use the sauce well beyond spaghetti. I absolutely love a recipe I can stretch into several meals, and I often cook that way. Many nights I wouldn’t get dinner on the table otherwise! Spaghetti and meatballs is a great starting point, but this recipe which I have revised over the years lends itself to so much more. (Links to two favorites follow.) So, whip up a batch then freeze some in one or two-cup containers. You’ll be so happy you did. Two great recipes which incorporate this flavorful marinara are Baked Fusilli with Asiago and Sausage, Pepper and 2-Cheese Pizza. Heat oil in a large heavy-bottomed pot or Dutch oven and cook onions over medium heat until softened. Add remaining ingredients and bring to a simmer. Cook over low heat for about an hour or until sauce thickens. How much does it make? Do you can yours? How long do you process the jars? I typically freeze the leftovers in one, two, or three-cup containers or jars so I have it ready for various recipes, as needed. Next time, I will have to note exactly how much it makes–I tend to use some straight from the pot then freeze the rest. As an estimate, you will get about three quarts. How would you process this sauce to store on a shelf? 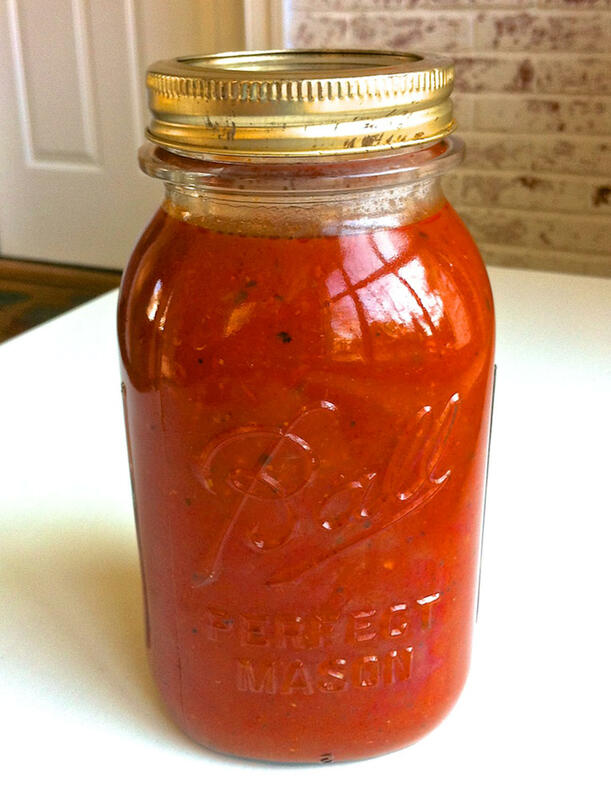 The standard instructions for canning marinara sauce say to leave 1/2-inch head space and process for 40-45 minutes. Because tomatoes are borderline in terms of pH, sometimes requiring extra acid to guarantee safe consumption, I typically freeze the sauce. I hope this helps! So glad you like, Haylee! I am a new cook and I have a question. Could I use fresh tomatoes from the garden for the marinara sauce, in place of the canned crushed tomatoes? You could definitely use an equivalent amount of fresh tomatoes. Ideally, you would want to remove the skin and seeds and may need to cook them down a bit longer. As an option, here is an easy fresh sauce I make using plum tomatoes and I am planning on making one later this week using cherry tomatoes. If you have any other questions, don’t hesitate to ask! I am not italian but my fiancée is and this is the best i can show him i make sauce lol. Thank you for the post, I’ve tried it twice already in 6 months..its that good! I do omit the oregano and thyme because he is not a fan. Such great feedback, Eve. I’m glad the sauce has been a hit!